(CNN) -- Manchester United manager Alex Ferguson admitted his team had lost to the better side after going down to a 2-0 defeat to Barcelona in Rome. A dejected Ferguson trudges off after his team were beaten in Rome. Ferguson's team were bidding to become the first side to retain the Champions League trophy, but were always on the backfoot once Samuel Eto'o put the Spanish side ahead in the 10th minute. The brilliant Lionel Messi sealed victory in the 70th minute as he rose unmarked to head home past Edwin van de Sar. "They were two bad goals to concede," Ferguson told ITV Sport. "They were very shoddy goals to concede." 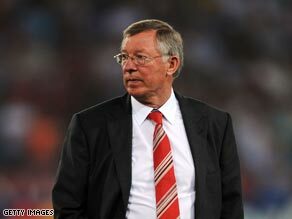 But despite his unhappiness with his side's defending, Ferguson could appreciate the quality of the Barcelona play. He told Sky Sports 1: "In fairness we were beaten by the best team. We weren't at our best. "The first goal was a killer, it was a bad start to the game. If you give them the ball they will keep it all night. "But the best part of the game is that in adversity you always move forward quicker. "We're all disappointed but we're a young team." Ferguson made a number of substitutions in the second half to pep up his under performing team, but to no avail. "I brought on (Carlos) Tevez simply because I took the gamble of playing two through (the middle). "Ryan Giggs, in the first half, provided something and some parts of his game were good but what we needed was someone to be there all the time. "But they defended quite well. We had plenty of time and we had some half-chances which we maybe should have done better with," he added. Vote: Who's best: Ronaldo or Messi? Barcelona's Thierry Henry was overjoyed after finally getting his hands on a Champions League trophy. He had been in the Arsenal team which lost to Barcelona in the 2006 final. "Finally I have won it! I have been waiting for so long for this moment," the France great told ITV Sport. "The last five minutes were the longest of my life. Even if we were 2-0 up we were playing the best team in the world." United had previously won the Club World Championship in Japan last December before adding the English League Cup and Premier League title to their trophy haul, but found Barcelona too good in their Champions League defense.